The Duke of Sussex told a fan he hopes his first child is a girl. Woman: ”I hope is a girl!“ The Duke Of Sussex: ”So do I“ Does he knows something we don’t?! ?? But if is a boy, you guys better make this video disappear ?? (Andrew Parsons/i-Images/Polaris) Prince Harry, The Duke of Sussex and Meghan Markle, The Duchess of Sussex visit Fraser Island, Australia, Oct. 22, 2018. "She's feeling fine but resting," a royal source told ABC News. Meghan Markle and Prince Harry are on a 16-day tour Down Under. Meghan Markle and Prince Harry toured Australia, New Zealand and more. "She’s feeling fine but resting," a royal source told ABC News. "We have to make sure she is well-paced and not overdoing it." "She wants to do everything, but Prince Harry is encouraging her to pace herself," the source added. "If it has been a very late night due to unforeseen circumstances, we have to adjust for that." (Andrew Parsons/i-Images/Polaris) Meghan Markle, The Duchess of Sussex visits Fraser Island, Australia, Oct. 22, 2018. Meghan, 37, was not with Harry, 34, Monday at his first events in Fraser Island, where the couple traveled to from Sydney by plane. Harry unveiled a plaque for the dedication of the Forests of K’gari to the Queen’s Commonwealth Canopy and participated in a traditional welcoming ceremony, among other events. (Stephen Lock/Pool via Reuters) Prince Harry, The Duke of Sussex talks to aboriginal 'Song Man' Aaron Henderson on the shore of Lake McKenzie on Fraser Island, Australia, Oct. 22, 2018. 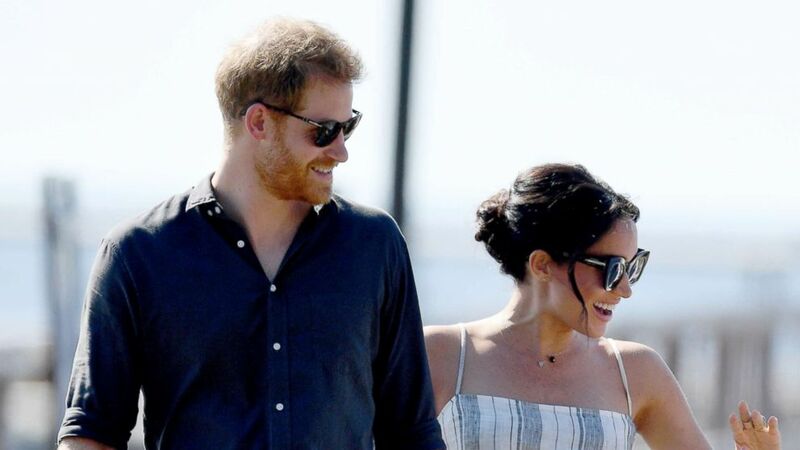 Later in the day, Meghan, wearing a sleeveless striped dress and sandals, joined Harry at Kingfisher Bay Resort Jetty on Fraser Island.